The Brvtalist is pleased to present a new mix from X tin. One of our favorite Berlin DJs delivers this powerful mix ahead of the massive event, Per Forma: Live Balance, taking place Thursday, June 21st at Arena Club Berlin. Per Forma is an interdisciplinary event that explores multimedia symbiosis, through the combination of live experimental and dance music acts, generative visual art, and performance art. Through postmodern clash and interdisciplinary confrontation, Per Forma integrates audio and visual experiences in a club environment, to discover the dynamic as technologies and art forms collide. Dubbed “Live Balance,“ the first edition of Per Forma focuses on the synthesis of the disciplines of live experimental music performance, techno, generative design, butoh and dance performances, and fashion. X tin will open with a DJ set and the night will also see live electronics by Byetone, Robert Lippok, Peter Kirn and more. 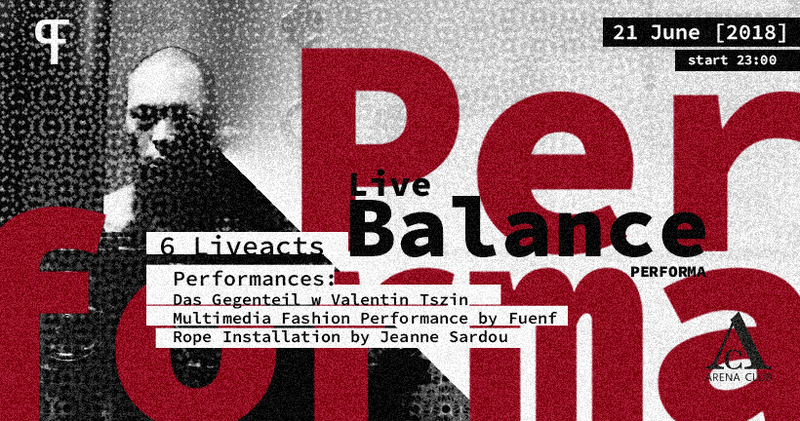 There will also be a much anticipated multimedia fashion performance by avant garde brand, Fuenf, as well as dance performances, Rope Installation by Jeanne Sardou and Photo Exhibition by Glazov Photoproject. Per Forma will truly be a feast for the senses and an event not to miss. For more info and tickets visit eventbrite.